Giant pandas have become an endangered species in the world and many people wonder why. These creatures seem so benign, innocuous, and harmless that a great deal of curiosity arises as to how and why their numbers diminish. As is the case with scores upon scores of endangered and extinct animals, certain unexpected changes contributed to a decline in population. Pandas, as is the case with other animals, must live in a very specific environment in order to survive. These creatures, which are cousins to the raccoon and not bears as commonly thought, must live in a forested area. The forest offers them the right climate and food source in which to survive. The intrusion of humans into their environment has had a devastating effect. Namely, humans have cut down the forests in which these creatures live. Specifically, the bamboo plants the panda relies upon for food are cut down. During the early years of human intrusion, pandas could move to another section of the forest where a food supply exists. Over time, as more and more forests are cut down, there is far less food for the remaining population of pandas. The result here is that the pandas end up starving to death. 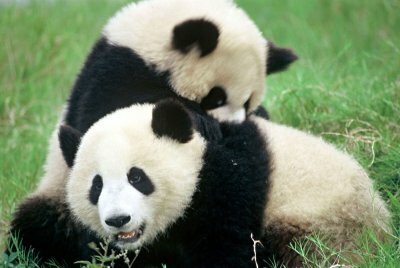 Many pandas were also slaughtered over the years by hunters who once killed them just for sport. However, such a practice is no longer commonplace today. At present, there are roughly only 1,600 giant pandas living in the wild. In southwest China, high in the mountain regions, a great deal of work and effort is being done to save these creatures. Conservation and breeding programs are being undertaken to grow the population of these magnificent creatures in the wild. So far, the results seem to be very positive.